The final #SmartWomenEU meeting took place in Vilnius on the 12-13 September. 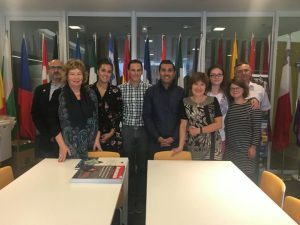 Partners from Lithuania, Latvia, Malta, Romania, Cyprus and Spain, spoke about their experience from the training, and how to ensure the Smart Women training course remains available for the coming years. In practice interested participants in the course will be able to take the course by using the material on the website and accessing the quizzes through the Moodle developed in the course. The meeting featured a visitor from the Lithuanian Women’s Business (BWA) association. The Chair of BWA Dalia, Foigt gave a presentation to partners about the work of BWA particularly focuses on policy work and legislative work to encourage more women to join the workforce. The Smart Women project was also presented to the BWA as a tool that can be used by women in Business. BWA as a s association provides support for women who want to start their own business, and in turn help use turn these businesses into other employment opportunities for women. To support women entrepreneurs and promote a culture of entrepreneurship for women BWA provides weekly lectures on business related issues and training on how to promote online business and managing legal matter such as GDPR. All partners in the Smart Women Project prepared videos on the trainings, here is an overview from all partners.